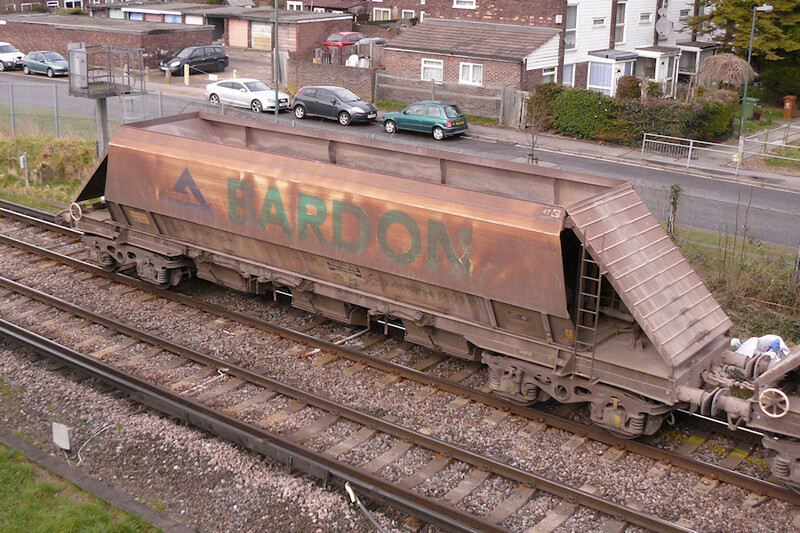 Summary: Bardon Hill Quarries (later renamed Bardon Aggregates) bought four batches of bogie hoppers between 1986 and 2004, totalling 73 wagons. They have been used in block formations between the quarries in Leicestershire and various terminals in the southeast of England. History: Bardon Hill Quarries was one of several firms that ordered bogie aggregate hoppers in the 1980s, the TOPS owner code of BHQ being assigned in 1985. At the same time, W H Davis of Shirebrook started construction of an initial batch of 21 wagons. The first, numbered BHQ17101, was delivered by January 1986 and was used for trials at the Thorney Mill stone terminal on the branch from West Drayton to Colnbrook. The remaining 20 wagons (BHQ17102-17121) were delivered to Bardon Hill (near Coalville) in April 1986 and replaced BR-owned MSV wagons on the services carrying crushed granite to Thorney Mill. The new wagons were given the TOPS code of PHA and design code PH010A. The appearance was quite similar to the Marcon hoppers built earlier by W H Davis, with an angular hopper body and large end plates to protect the brake equipment. The Bardon wagons differed in having continuous solebars (albeit with the same weight-reducing cut-outs as the Marcon wagons) and lower discharge chutes. The lower part of each hopper side featured 11 vertical ribs and the wagons were mounted on the ubiquitous Sambre et Meuse fabricated Y25 bogies. What really set this batch apart was the distinctive livery. The hopper was mid-green with prominent striping and �Bardon� lettering in bright yellow. Solebars and bogies were intially black. A follow on order for 8 identical wagons was delivered in 1988, these taking the numbers BHQ17122-17129. The livery was changed slightly with this batch, with everything below the floor level (including solebars, bogies, hopper chutes, buffers and even the wheels) being painted yellow. With a new terminal opening at Angerstein in southeast London, an order was placed for a third batch of 22 wagons. Built again by W H Davis, these were delivered in 1990 as BHQ17130-17151. By this time, the TOPS code of the earlier wagons had changed to JGA (JGA-K to design code JG010A) and the new wagons were given design code JG010B. The appearance was slightly different with fewer hopper side ribs, plain solebars, revised hopper operating gear with prominent door actuators and cast rather than fabricated Y25 bogies. A third variation of the livery was worn whereby the solebars were green to match the hopper but the bogies and hopper chutes were yellow. It is believed that some of the original wagons (JG010A) had their solebars repainted green. Bardon Hill Quarries merged with Camas Aggregates in 1997 and was renamed Aggregate Industries although the Bardon name was retained for the existing operations. 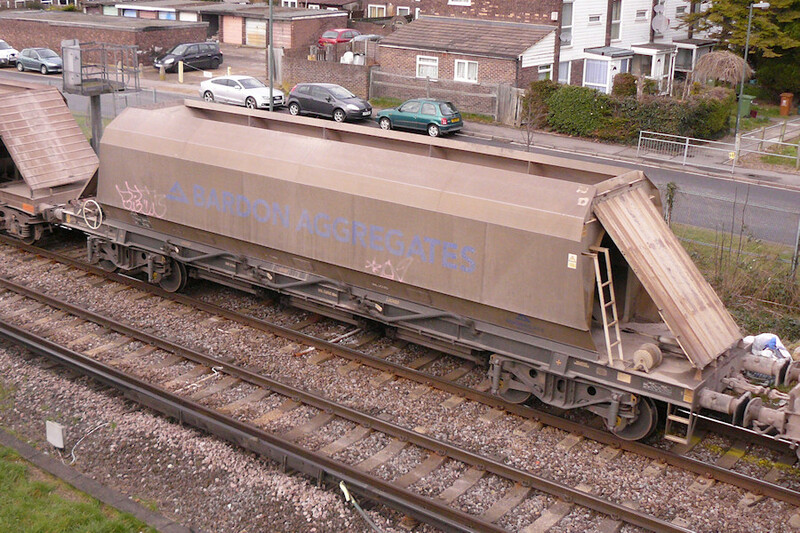 The wagons were gradually repainted in a new livery, which featured the Aggregate Industries logo in blue alongside the green Bardon name. When ex-works, this livey comprised a white hopper body with everything below (solebars, headstocks, buffers, hopper chutes and bogies) being mid blue. In service, the body quickly weathered to a brownish off-white shade while the blue of the underframes dissappeared under a coating of track grime and dust. It is possible that some wagons had the bogies and underframe painted black but it is virtually impossible to tell from photographs. In many examples, even the company names and logos are rendered invisible. The wagons started appearing on services from the former Camas quarry at Croft (on the line between Nuneaton and Leicester), principally to Bow in east London. Other loading terminals at Swansea and Wool (Hampshire) were served mainly by PGA and KPA hoppers latterly hired to Camas. In 2004 Bardon Aggregates ordered a fourth batch of bogie hoppers from W H Davis, the contract for 22 wagons being valued at �1.5 million. This batch was intended for new services from Bardon Hill to Harlow Mill and Washwood Heath but also appeared on duties from Croft and to Angerstein. The design and livery of this batch was quite different from the earlier wagons. Numbered AI27101-27122 as JGA-Ns to design code JG017A, they featured a hopper body in unpainted metal with blue �Bardon Aggregates� lettering. Solebars and below were black. The hopper end plates were smaller and the plain solebars had some curious door operating equipment mounted on them. From a distance these look rather like hoses. Most notably, the wagons were mounted on utilitarian-looking Probotec LTF-25 bogies. First batch wagon BHQ17103 was withdrawn sometime in the 1990s, probably as a result of accident damage. Of the remaining 28 JG010A wagons, by 2008 one had been amended to design code JG010C and four to JG010F. The JG010C wagon (BHQ17123) had been fitted with tie-down lugs in 1995 to allow the load to be sheeted but the reason for the other change is not known. Some of the Bardon hoppers were finally treated to at least a partial repaint in 2014. The vertical sides of the hopper were covered in mid-grey (the shade varies), while the remainder of the hopper and underframe were left untouched. Updates: 10/05/2015: Repaint note added. BHQ17147 at Abbey Wood, 15th March 2013. Partially repainted JGA BHQ17126 at South Acton, 18th February 2015. AI27108 at Abbey Wood, 15th March 2013.